Don’t have all the money you need for an AC? Need to cool a large room rapidly? Take the simple alternative of Installing a Ceiling Fan instead! I agree that these fans are not really effective when it comes to cooling a room quickly. But these fans are not pushovers either. When used correctly, a ceiling fan can substitute for an AC just as fine. Many of us don’t know how to install a ceiling fan properly and end up misplacing a nut or two. This leads to irregular motions and squeaking sound. Furthermore, the air quantity degrades in the room. During hot Summer days, this is a problem! Fortunately, I know how one can install these things correctly and am willing to share! In this article, you’ll be learning how to put together a ceiling fan without any hassle. 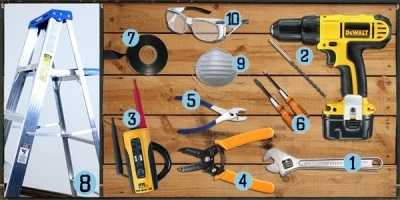 Naturally, I’ll be going over some of the tools that you need for the job as well. When you are embarking on an epic task such as this, obviously, you’ll need tools of the trade. Let’s imagine a scenario where you don’t have the box needed for the fan installed. We’ll start from the ground up. I’ll base my quiver of tools on that fact. A ceiling fan (that’s a no-brainer!). Mounting kit (Included in fan accessories). A Wire Stripper (Since we’re going to work with wires). We’ll be doing this from the ground up. Ceiling fans are quite heavy. Normal Ceiling boxes won’t be able to support the weight of such a heavy object. That’s why we’ll be installing special boxes that can take the weight. Naturally, I’ll cover that part too! People might not realize it yet but choose the ideal fan matters to make sure you have proper air ventilation in and outside of your room. One needs to measure the longest wall of his/her room first. Take up measurement tape and a pencil to note the dimension. If you have a 12-feet wall, you’d need a 36-inch fan to cover the room. If the wall is 12 to 15 feet, people need a 42-inch fan. If the wall is more than 15 feet, try a 52-inch fan. Whenever selecting a fan, go with a reputed brand. You need to check on warranties and perks of the fan to make sure you are covered when it comes to damages. If you don’t have a fan installed, determine the place of the room where you’ll put one (usually the middle) and carve out a hole through the ceiling. If you already have one, proceed to next step. Go to the attic and remove the “Normal” box from the joist by removing the nails. Don’t forget to take a new box to the attic. Some of the old boxes cannot be removed normally. If yours presents a similar case, pry it out of the wall or break into it. Yes, the wires will still be there. There are special boxes that can be mounted through holes. They are easy to connect with wires. You have extended bars that help to extend the reach of the box to the joist and protect the wires. If you don’t want that, you can cut a hole over the joist. There are certain boxes that hover over the joist itself. Slide the new ceiling fan box in. Check if it is working correctly with a testing tool. Make sure to connect the wires accordingly. Most of the boxes have color-coded wires that are easy to figure out and put together. Fans that utilize a remote have a set of white wires. Connect these wires to a power outlet where the power stays on. If you have extra wires that are lying around, make sure to push them inside the box to avoid entanglement. When connecting different wires, use “Wire Nuts” to stay safe from hazards. One needs to follow the manual that came with the product itself. Make sure to be careful when assembling the blades. These are mostly “Two-Pronged.” One needs to keep the threads in line. Then, people just need to screw the nuts in place. Use a screwdriver. However, don’t push them too hard. They’ll get damaged. There are models that require you to mount the prongs directly onto the motor housing. If you come across one of these models, make sure to do the mounting of the prongs first. Then, put the blades in place to avoid any hazardous situations. You should put the blades in place before you hang the fan. The length from the ceiling to the blades are shorter than that of a screwdriver. With some of the models, people get Speed Rings. These rings allow them to assemble the blades while the fan is on the floor for added safety. In these cases, users will have to fasten the blades to the rings. Then attach the rings to the motor. Fasten them with rubber grommets and screws. These speed rings come with covers. Put them on. Finally, put the decorative plate on and fasten it with screws. How to Mount the Accessory? Remember the fan box you installed at the beginning? It’s time to put that to use. Attach a hanger to the box. Users will have two types of hangers to work with. First one is the “Hook-Style” hanger and the second one is the “Half Ball” hanger. Whichever the case, you need to check up with the bracket. It might fit with both or any one of the types. Make sure to slide the hanger into the bucket before you do anything else. When using a “Half-Ball” hanger, make sure to twist it until the bracket aligns with it. Here’s another tricky part. After assembling the unit on the ground, you need to take it up. This is where the intricacy begins and most people forget how to install a ceiling fan. 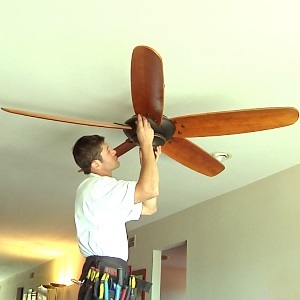 To avoid any mishaps, make sure all the tools are at hand and the fact that you finish assembling the fan correctly. Take a stool, your tools, and get ready! Do you have the fan canopy at hand? Attach it to the motor housing. Make sure you put the mounting ring and screw it tight. For people who have long ceilings, use hanger pipe to bridge the gap. Now, people can hang the motor unit in between the two hooks. You’ll do well to connect the wires (of the fan to the box). You’ll do well to start from the ground. Use your wits to connect the black house wire to the same of the fan. Do the same thing for white wires of each thing. Connect the power supply of the house with the fan using a wire nut. You have the cover nearby. Pull it all the way up and tighten all the screws in place with a screwdriver. It’s time to cross check if you’ve tightened the motor unit with the screws in place. When done, please turn on the power just to see if the fan’s running as it should. As we dwell on how to install a ceiling fan and find our way around the problem, I must tell you that you need steady hands for the job. Also, follow each step correctly and improvise a little if you have to. You’ll notice the task will get easier as you move through the process. However, wear safety gloves and make sure the power is turned off most of the times. I’ll go as far as saying, “Cover your feet with rubber shoes.” This really helps to prevent any shocks. If you are absolutely unsure about how to go about the thing, take the safe way out. Call an electric engineer.